Late M Hassan, a local art enthusiast began the construction of Lamakaan as a residential building in 1972. After Hassan’s death in 2010, his nephew Ashhar Farhan and his wife Humera, with friends — film producer and actor Elahe Hiptoola and activist Biju Mathew turned it into the iconic cultural space we know it as today. In the past eight years, Lamakaan has become a favourite among city folk who often come here for the film screenings, plays, art exhibitions and for the ever famous samosas and nimbu paani. Most of them even end up spending their entire day at this place. If you’re wondering what entices people to the place or what keeps them engaged (and it’s definitely not the decor), then there’s plenty to be talked about. Apart from the homely vibe of the place and its delicious nibbles and snacks, it is the community that Lamakaan brings together and makes up its heart and soul. A regular day at Lamakaan begins with either a workshop, an art exhibition at 10.30-11am. The place is vibrant and the crowd comes in with a fresh mind to learn new things, and the activities are fun. If nothing’s happening (which is rare), people usually come here to rehearse for their plays and films or brainstorm over ideas. On Sundays, however, there is an organic bazaar organised here where you can pick up quirky accessories and clothes. If you are looking to go here just for a meal, don’t really because there isn’t any thing fancy to be had. But regulars do swear by the simple yet homestyle menu food, and everything is on a budget. If you are spending the day here, we recommend getting roti for INR 10, with veg curry for INR 40 followed by plain rice (INR 30) and khatti dal (INR 50) or chicken curry (INR 80). They also have Mutton Qeema (INR 100) and khichdi (INR 50). Self-service and sharing tables with complete strangers is a norm at Lamakaan, so find someone interesting to sit next to and break bread together. Don’t forget to get a glass of nimbu paani or sweet lassi here for a mere INR 20. The lunch timings are between noon and 3pm during which you can read one of the books from the stacks available here, or have conversations with others at the table too. Now that lunch is done, you can relax for a bit in the outdoor space, brainstorm ideas with other creative bees (and make use of their free but rather slow WiFi or admire the photos hung in the building if you’re visiting for the first time), or take a look at the bulletin boards at the entrance and find interesting activities — from casting calls to workshops. Evenings at Lamakaan are vibrant with bustling crowds, awaiting upcoming performances, chattering and helping about with the set-ups too. Plays, lectures, impromptu poetry sessions, stand up comedy, film-screenings, and interactive sessions are what evenings are for. So, grab your cup of chai as the kitchen closes minutes before an event begins to ensure no disturbance. Artists like Ratna Pathak Shah, Nagesh Kukunoor, and local performers like Warsi Brothers, Ateeq Hussain Khan, and several others have performed here. Independent groups and NGOs can host their events here for about INR 500 (for free events) to INR 2,500 (for paid events) a day. 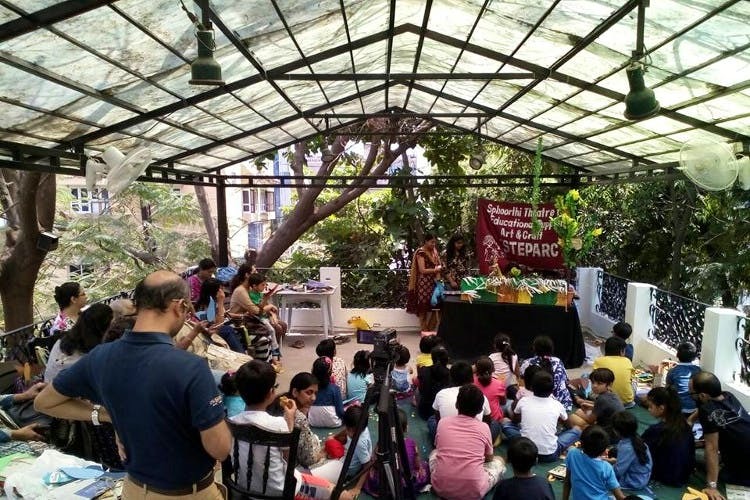 There are regular meetups hosted on the terrace by groups like The Write Club, every Saturday. All in all, Lamakaan is a space where you can work with passionate individuals towards things that matter to you, experience the rich culture our lovely city offers and encourage other artists.